King John died in 1216 AD, the year after John signed the Magna Carta. 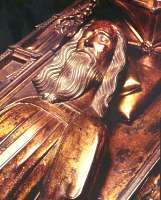 His son Henry III succeeded him. (Henry III was named after his grandfather Henry II.) Henry III was only nine years old when he became king. So he pretty much had to do whatever the barons (the rich men) told him to. Even when Henry III grew up, he never became a strong king. The rich men were able to make him do what the Magna Carta said. Because Henry III was so weak, the Parliament (a council of the advisors of the king) became stronger. Parliament now made a lot of the government’s decisions.This is when Parliament started to meet at Westminster, where they still meet today.Henry III ruled for fifty-six years, so the Parliament had plenty of time to get used to being in charge. Meanwhile, the lords became richer by selling thousands of bags of high-quality wool every year to French and Italian weavers. They made the wool into good cloth to sell along the Silk Road. Deeper coal mines also brought people more coal to heat their houses. When Henry III died in 1272 AD, his son Edward I became the next king of England. Edward was a stronger king than his father, but he saw the wisdom of getting along with the rich families. So he also held Parliament regularly. Edward also got control of the courts. Nobody could be a judge or put anyone in prison or kill them without his permission. 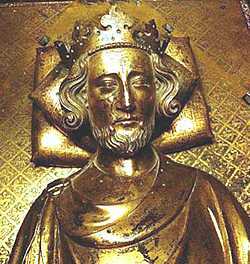 But in his efforts to get control of his kingdom and everyone in it, Edward I also decided, in 1290, to force all the Jewish people living in England to leave. About 16,000 Jews left England, mostly settling in France or the Netherlands. After Edward I came his son Edward II. 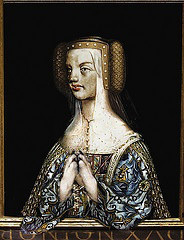 Like her ancestor Eleanor of Aquitaine, Edward II’s wife Isabella of France (the great-great-granddaughter of Blanche of Castile) led an armed rebellion against him in 1326. She succeeded, and ruled England herself as regent for her fourteen year old son, Edward III. When Edward III grew up, he seized power from his mother, and ruled on his own. He spent most of his life fighting the Hundred Years’ War. Cite this page: Carr, K.E. Medieval England – History of Europe. Quatr.us Study Guides, August 2, 2017. Web. April 20, 2019.